Whether it's a chimney, a sidewalk, or a patio, unsightly stains detract from the natural beauty of masonry. Harsh cleaning methods, including sandblasting, can damage the protective Outer layer of masonry. This leaves the surface more susceptible to deep water penetration, which is a major cause of damage to masonry materials. Restore-It was developed to protect your investment by safely restoring masonry to its original appearance. 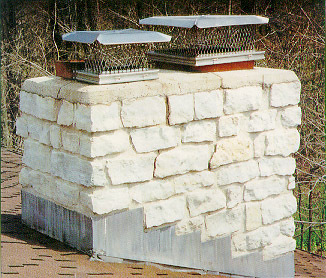 To prevent further staining of masonry, replace rusted flashing or chimney caps with aluminum, stainless steel, or Other non-ferrous materials and apply ChimneySaver® water repellent. Restore-It masonry cleaner removes rust, creosote, mold, mildew, and a variety of common stains from masonry surfaces. And it is more user friendly than comparable cleaners. The photos below illustrates how Restore-It effectively removed rust stains from a natural stone chimney without damaging the stone or mortar joints. 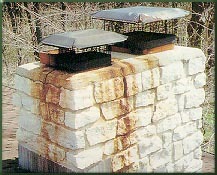 ChimneySaver® water repellents add years of warranted protection to your restoration work. Take advantage of these benefits to protect your masonry from water damage.